Encouraging European youth to consider careers in STEM is essential to ensuring a skilled workforce, ready to fill the high-tech jobs required to solve the energy challenges of the future. To foster this growth, Junior Achievement – Young Enterprise (JA-YE) Europe and ExxonMobil have been working together to inspire young people to pursue STEM-related studies and careers through the Sci-Tech Challenge initiative. 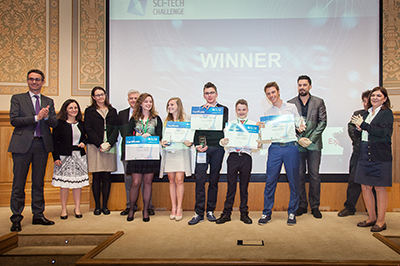 On 21-23 April, a group of over 50 students from nine European countries participated in the Sixth Annual European Sci-Tech Challenge, held this year in Bucharest, Romania. The participants qualified by winning the national Sci-Tech Challenges in their respective countries. Student teams were given 24-hours to find an innovative way to minimise the carbon footprint of the 2015 Eurovision Song Contest. Whilst overcoming language and cultural barriers, students applied their STEM knowledge, creativity and entrepreneurial skills to succeed. The 2015 winning team - Juliette Duval (France), Lauren Sillis (Belgium), Jack Francis (United Kingdom), Mattia Fusetti (Italy) and Arkadiusz Przywecki (Poland) - was chosen based on their team spirit, excellent presentation skills and outstanding innovative idea. Their “magic carpet” concept would be a technological invention that produces energy through static friction and reduces energy consumption at the same time by less people watching the contest at home on their private television. By placing their “magic carpets” in front of large community viewing screens in cities across Europe, the team said that individuals could generate energy through their movements. Launched in 2010, the Sci-Tech Challenge invites 15 to 18-year-old students to address societal and energy challenges through innovative STEM-methods. The annual programme, has thus far involved more than 1,500 volunteers from ExxonMobil and engaged over 45,000 students in Europe. By having experienced employees participate as role models in the programme, ExxonMobil actively helps students understand the vital importance of STEM skills for exciting professions, which will help address future energy issues. JA-YE Europe is Europe’s largest provider of entrepreneurship education programmes, reaching 3.2 million students in 39 countries. JA-YE brings the public and private sectors together to provide young people in primary and secondary schools and early university with high-quality education programmes to teach them about enterprise, entrepreneurship, business and economics in a practical way. The JA-YE Company Programme is recognised by the European Commission Enterprise Directorate General as a ‘Best Practice in Entrepreneurship Education’. ExxonMobil is the world’s largest publicly traded integrated petroleum and natural gas company. It operates facilities and market products globally, explores for oil and gas on six continents, and employs more than 77.000 people. For over 125 years, ExxonMobil has been a leader in the development of energy sources and technology. ExxonMobil is committed to helping meet the world’s energy needs while addressing the challenge of sustainability – balancing economic growth, social development, and environmental protection. ExxonMobil uses innovation and technology to deliver energy to meet the world’s growing demand. Extensive research programs support operations, enable continuous improvement in each of the business lines, and explore new and emerging energy sources and technologies.